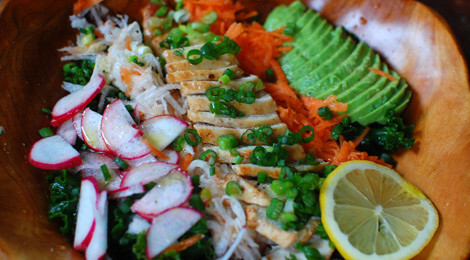 This is the kind of salad you make for dinner or lunch and eat warm. Though it can be enjoyed left over and chilled, I feel you get the most out of it when you eat it freshly made. This kale is blanched; which is basically just another word for boiled, and amazingly fresh tasting. Served with some raw veggies, spiced and seared chicken, lemon juice and olive oil and you have nothing but a nutrient dense bowl of real food. Switch the chicken out for tofu or tempeh. Add some nuts and seeds if you so desire. The idea here is to use what you have in the fridge-ideally, seasonal vegetables. Blanching kale takes you only a few minutes and cooks down very well. 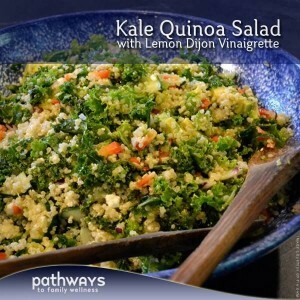 Though we love our massaged kale salads, this may be our new method of serving kale. Eating paleo is about eating simple. Eating clean. Eating real, nutrient dense food that is going to nourish your body. Provide your body with what it needs, and I’m sure it will be ever thankful for the favor. Begin by bringing about 8 cups of water to a boil over the stove. 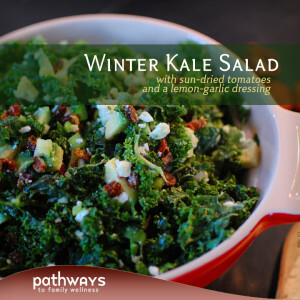 Add kale and boil (aka blanch) for about 4 minutes or until the color becomes vibrant and leaves begin to wilt. Remove from water and let drain in a colander. Prepare your other vegetables and set aside. Season your chicken generously with garlic powder, ginger root powder, sea salt and freshly cracked pepper. Add about 1 T butter to a pan over medium heat. Once hot, add chicken and begin searing. Allow to brown on one side for about 5 minutes before flipping. Once the next side is browned, add a splash of tamari and let chicken soak in it. Continue to cook flipping or rotating if needed to get an evenly browned breast until the middle is cooked-about 10 minutes total. Cut the chicken in half to be sure. Set aside. 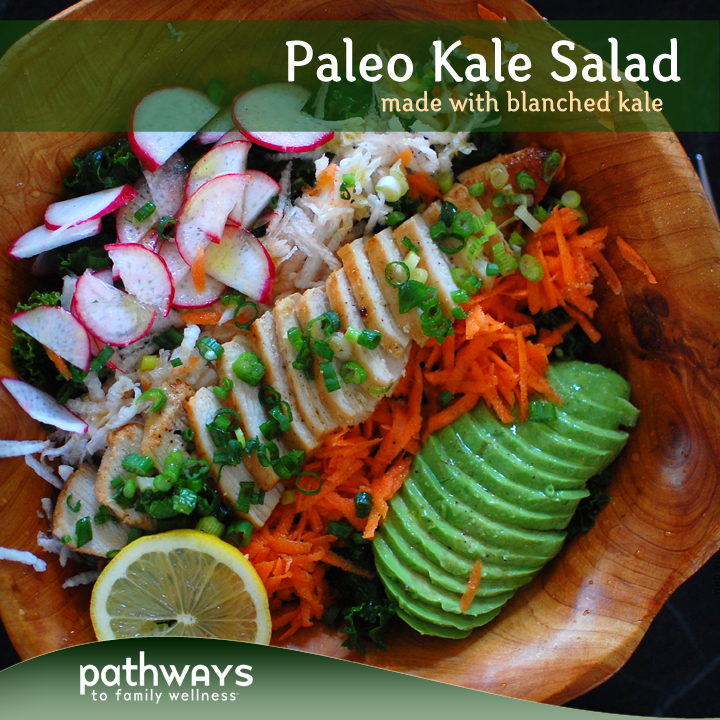 Add kale to your favorite salad bowl. Toss with some salt and pepper. 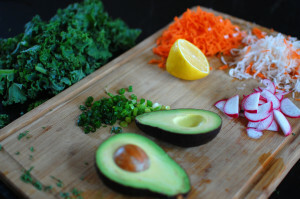 Top with your shredded carrots and turnips, sliced radish and avocado. Slice your chicken and add to salad. Add chopped green onions, lemon, olive oil, more salt and pepper if desired and serve warm.